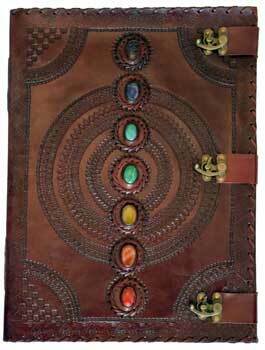 A massive tome with three latches to keep it closed and a line of 7 Chakra stones running down the front over the simple mandala centered on the cover. Embossing at the edge and on the rear cover may vary. Size may vary slightly. 180 blank, handmade, linen parchment paper pages. 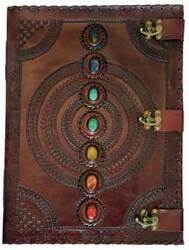 13 1/2" x 18", (made from goat leather). Latches show signs of oxidation.